The model 4608 is an solid state timing module that operates a set of high power 20 Ampere contacts on a repeat cycle basis. The ON and times of the cycle are set with DIP switches. The ON and the OFF time can be set from 1-1024 seconds in one second increments. The output contacts are closed for the ON portion of the cycle which always starts first on initial application of operating voltage. The model 4608 can be purchased in either a 115V AC or 230 V AC version. Timing Mode ON/OFF Repeat Cycle. ONOFF Periods 1-1024 Seconds On, 1-1024 Seconds Off. Timing Adjustment Ten (10) DIP switches control the ON and OFF times in a binary manner. 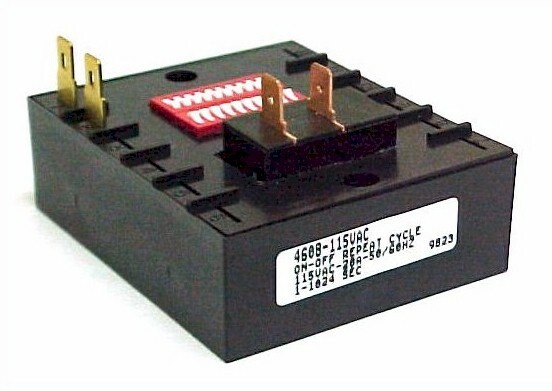 Output SPST contacts - Normally Open, UL/CSA rated for 1 HP, 20 Amp 250V AC, 1.5 HP, 20 Amp 125V AC. 1000V rms. breakdown between voltage between contacts and input terminals. Operating Temperature -10 deg F to 145 deg F.
Terminals .250" Quick Connect type.